Aftermarket wheel specifications are 17 Diameter x 9 Wide with 4.5 Back Spacing. Tire Width: No greater than 12.5 when used on stock wheels, or aftermarket wheels with stock Back Spacing (6.0). Check wheel size recommendations of tire manufacturer. 13.5 width tires can be run with a 4.5 Back Space wheel, but some fender scrub may be experienced during full articulation. Wheel Width: 7.5 (stock Rubicon) to 9. Wheel Back Spacing: 6 (stock) to 4.5 (preferred). As Back Spacing dimension decreases, track width and stability increases. 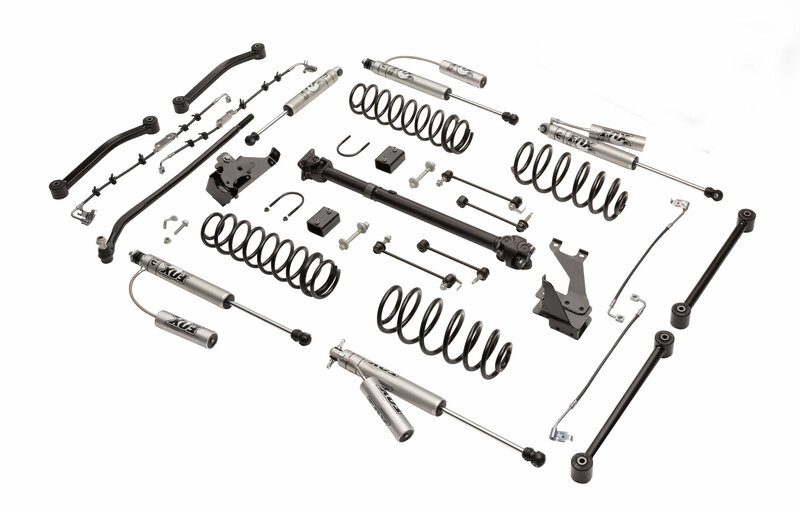 This is great lift kit for your JK. Ride is awesome, it really IS better than stock especially when paired with the recommended tires (35" BFG KM2's @ 28 PSI). As one reviewer said it is lacking some parts (sway bar disconnects and adjustable control arms) that some kits in the same price range have, but the Fox reservoir shocks make up for the difference PLUS let's not forget the MOST AWESOME shipping container ever. I would highly recommend this kit for anyone looking to add 4" of lift and not wanting to sacrifice your spleen to get it. The only reason this didn't get 5 stars is the lack of sway bar disconnects and adjustable lowers. I feel that for this price those should be included rather than fixed. However this is a fantastic lift and has everything else you could ever want. Plush, noise free ride, and a joy to drive. This is top notch. What is the average install time for this kit? 4-6 hours of shop time.